Most blessed Trinity, Father, son and Holy Spirit, behold us kneeling in Your Divine Presence. We humble ourselves deeply and be of You, almighty Father, and with all our hearts we thank you for having given us Your Divine Son Jesus to be our Redeemer. We adore You, Word of God, Jesus our Redeemer, and with all our hearts we thank You for having taken human flesh upon Yourself and having become priest and victim for our redemption in the sacrifice of the Cross, a sacrifice that, through Your great love, You renew upon our altars. We adore You, Divine, Spirit, and with all our hearts we thank You for having worked the unfathomable mystery of the Incarnation of the Word of God with such great love for us, a blessing that is being continually extended and increased in the Sacrament of the Eucharist. By this adorable mystery grant us all the poor sinners Your holy grace. Pour forth Your sacred gifts upon us and upon all redeemed souls. Amen. 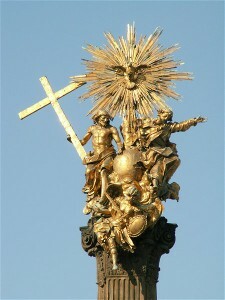 The stature above is depiction of the holy trinity on the top of the Holy Trinity Column in Olomouc, the Czech Republic, God the Father and the Son stand on the sides of the Earth, the Holy Spirit is placed above them and Archangel Michael with a sword and a shield below them made by Olomouc goldsmith Simon Forstner.